Discovery Science video - this segment includes the paddle boats, terracotta warriors, cross bows, metal stirrups, iron plow, plant crops in rows, etc. Compass, gyroscope, odometer, sail carriages, shipbuilding, and sailing vessels. 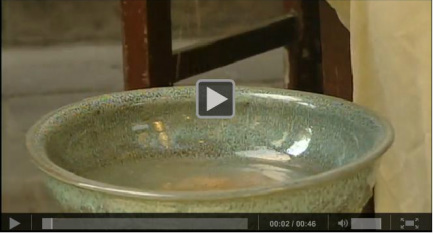 The ancient Chinese discovered how to make porcelain with one crucial ingredient...extreme heat. See why the Chinese were the only ones in the world who had the technology to make this delicate art form on The Science Channel's "What the Ancients Knew." The people in the South Sea Islands have used kites for fishing. The very first documented kite was made by Mo Di (468-376 BC). Gongshu Ban made a kite in the form of a magpie, using bamboo and silk. Instead of being playthings, early kites were used for military purposes. Historical records say they were large in size; some were powerful enough to carry men up in the air to observe enemy movements, and others were used to scatter propaganda leaflets over hostile forces. Both Chinese and Japanese learned to use kites for raising soldiers into the air as spies or snipers. The invention of paper made kites cost less and they quickly spread among the common people. It could be said that the kite was the original inspiration for man to fly, and so is directly the forerunner of the aeroplane. The first 3 minutes of this video clip describes the Chinese invention of kites and how they were used. Paper was invented in 105AD by Cai Lun. UNESCO: List of Intangible Cultural Heritage in Need of Urgent Safeguarding - 2010. One of the world's oldest printing techniques, wooden movable-type printing is maintained in Rui'an County, Zhejiang Province, where it is used in compiling and printing clan genealogies. Paper cutting is a popular folk art in rural China for several thousand years. Today we will present you some techniques and themes of this folk art. Since the Chinese Song dynasty, brush painting has been characterized by containing four elements: poetry, painting, calligraphy and stamp. NOTE: If you want to learn how to Chinese Brush paint something in particular, just search on YouTube for "chinese brush painting <subject>". For example search for "chinese brush painting fish". In the mid-ninth century, Chinese chemists, hard at work on an immortality potion, instead invented gunpowder. They soon found that this highly inflammable powder was far from an elixir of life -- they put it to use in bombs against Mongol invaders, and the rest was history. Eric Rosado details how gunpowder has caused devastation around the world, despite the incandescent beauty of fireworks. 1200 B.C. : COWRIE SHELLSThe first use of cowries, the shells of a mollusc that was widely available in the shallow waters of the Pacific and Indian Oceans, was in China. Historically, many societies have used cowries as money, and even as recently as the middle of this century, cowries have been used in some parts of Africa. The cowrie is the most widely and longest used currency in history. 1000 B.C. : FIRST METAL MONEY AND COINSBronze and Copper cowrie imitations were manufactured by China at the end of the Stone Age and could be considered some of the earliest forms of metal coins. Metal tool money, such as knife and spade monies, was also first used in China. These early metal monies developed into primitive versions of round coins. 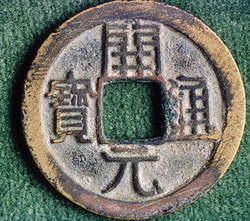 Chinese coins were made out of base metals, often containing holes so they could be put together like a chain.